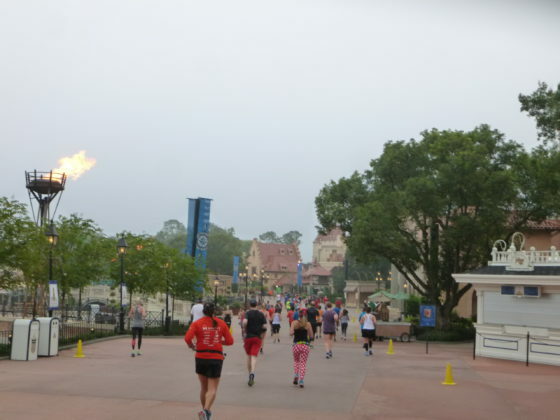 The eighth annual Wine & Dine Half Marathon Weekend was held November 2nd through the 5th, 2017 at the Walt Disney World Resort. 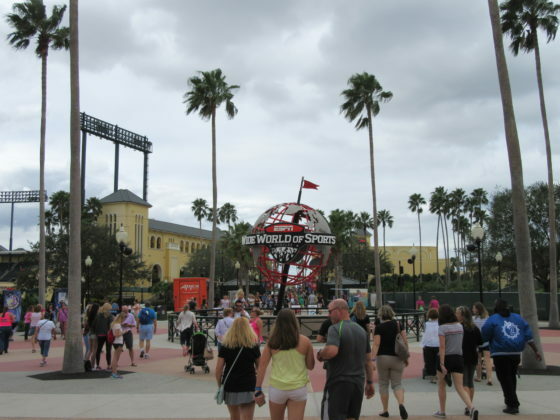 The event featured an expo, kids races, 5K, 10K, half marathon, and a late-night after-party at Epcot’s International Food and Wine Festival to cap the weekend off. 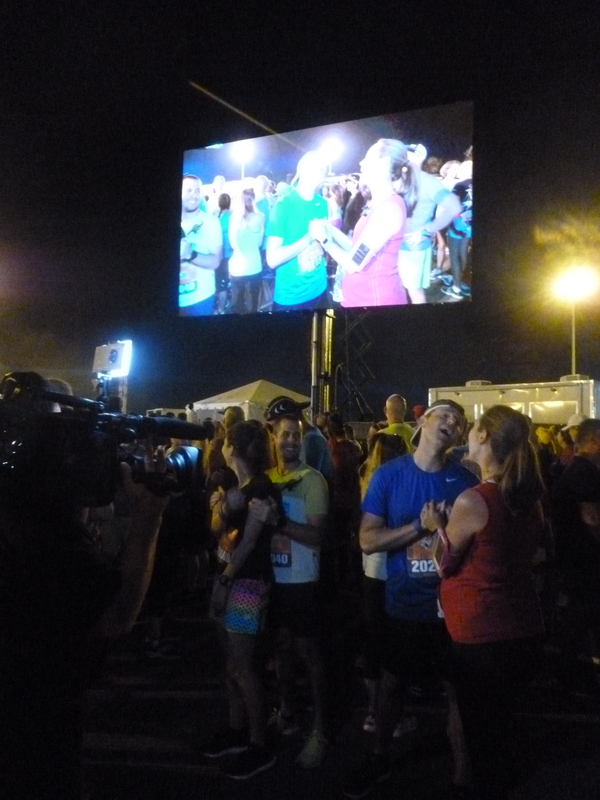 Nearly 5,800 runners completed the Two Course Challenge, conquering the 10K on Saturday and Half Marathon on Sunday. 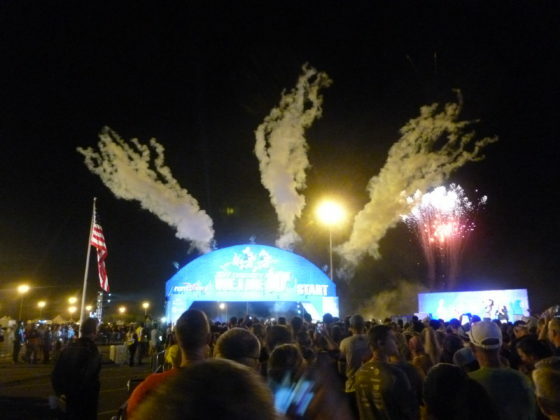 Previously billed as “the ultimate runners’ night out,” this was the event’s second year using the standard morning race format. 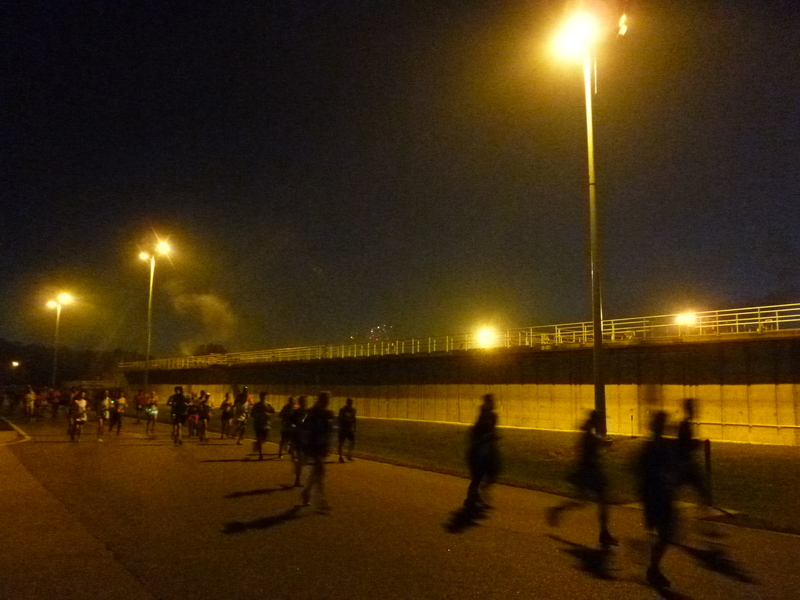 I experienced the night race twice, but this was my first time running it in the morning. 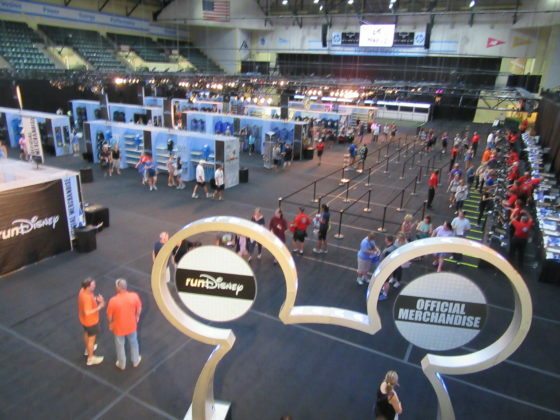 Arriving at Disney World midday on Friday, I headed straight to the ESPN Wide World of Sports Complex to pick up my bib and event packet at the Health and Fitness Expo. After a quick stop for lunch, I was pleasantly surprised by how completely painless the expo was. I breezed through both buildings in about 10 minutes, including time to look over the official and third-party merchandise locations. Even knowing this is a smaller race weekend, I was surprised by how minimal the crowds were; I assume I just happened to time it during a lull between the crowds. 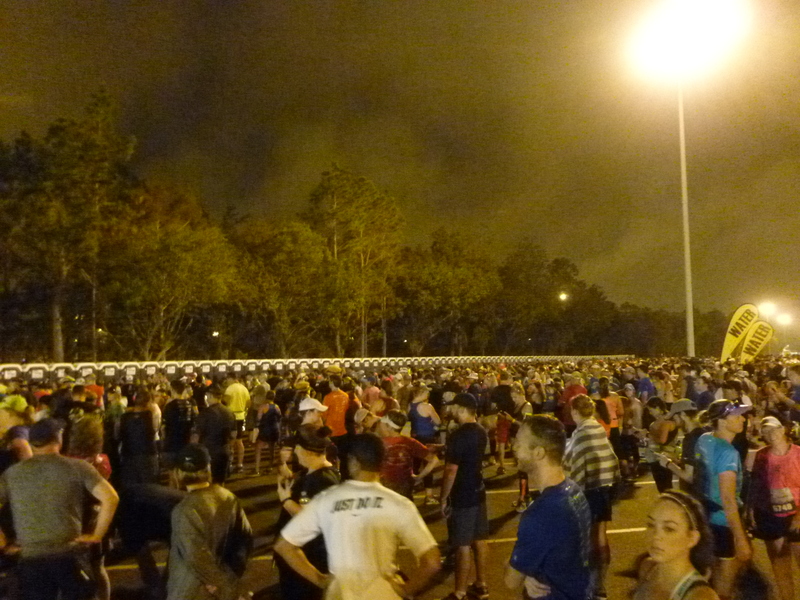 Saturday morning’s 10K course began on the southern edge of the Magic Kingdom parking lot. After passing the Car Care center, runners proceeded several miles down World Drive, taking the exit ramp to Buena Vista Drive. Entering the Studios backstage near the Fantasmic! 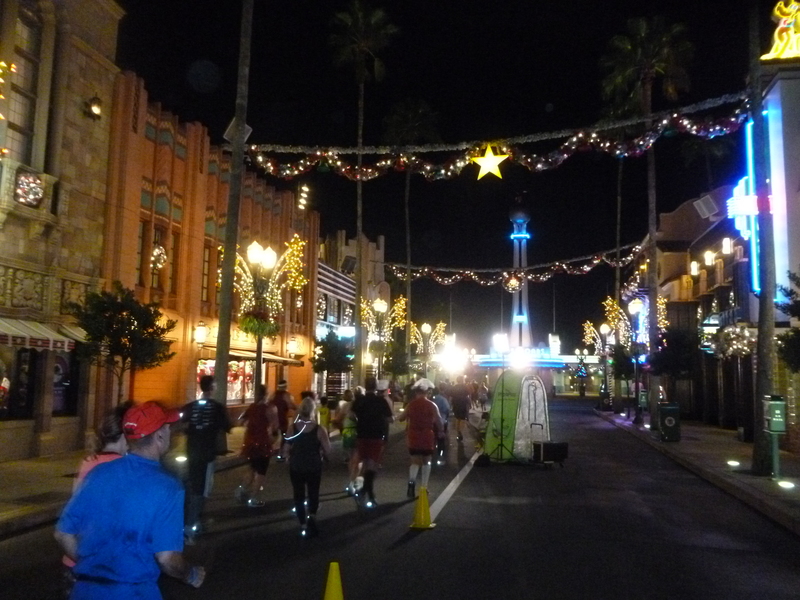 arena, the course went down Sunset Boulevard, up Hollywood Boulevard, and continued along the canal to the Boardwalk. 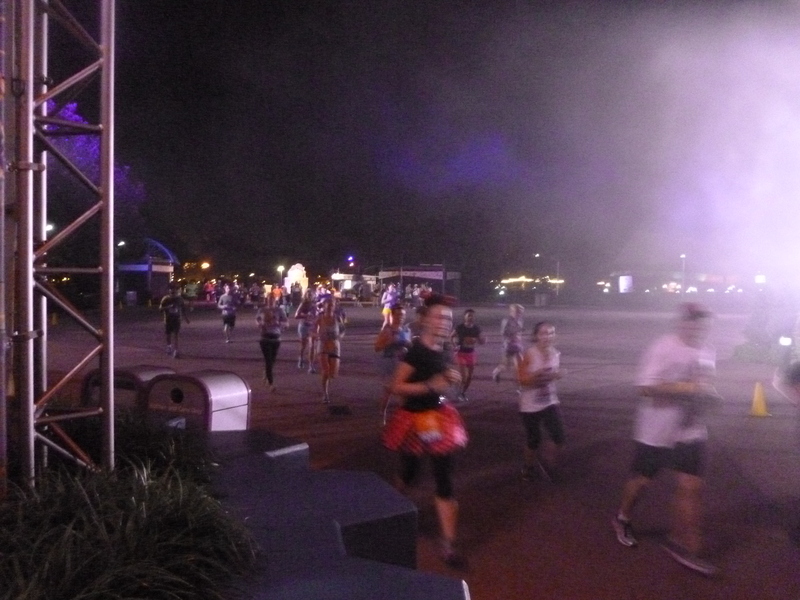 Runners then entered Epcot near the United Kingdom pavilion and passed through Future World to the finish line in the Epcot parking lot. 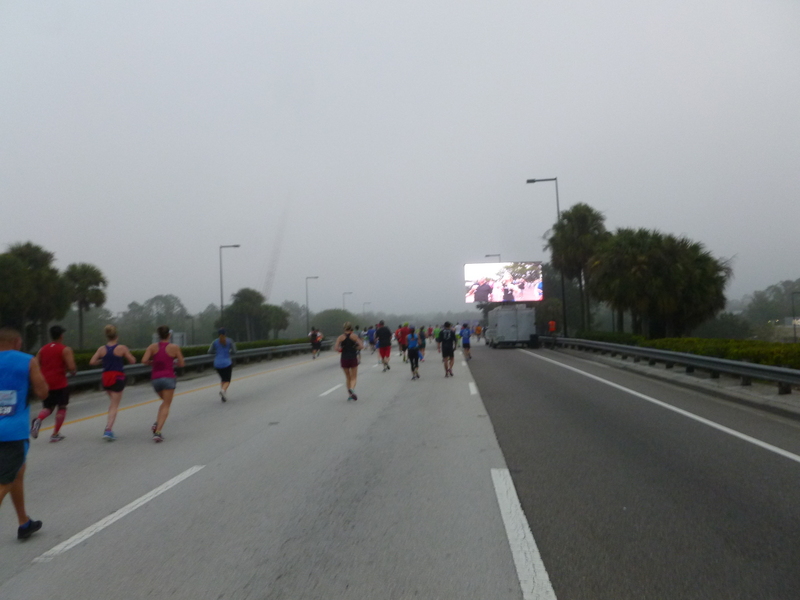 Upon arrival at the start area, we were met by pleasantly light crowds. After a quick port-a-potty stop, we headed into our corrals to be entertained by a DJ for about 45 minutes. Although I typically hate forced audience participation, the lipsync/karaoke contest led us in actually turned out to be a lot of fun, and a great way to kill time waiting for the event to start. 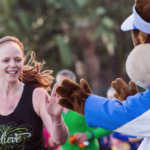 Having sustained a minor injury in an attempted marathon double a couple weeks earlier, I wasn’t sure what to expect out of my running abilities. Walking as part of my daily routine wasn’t an issue, but I hadn’t run at all in the previous two weeks. Starting near the back of corral A, I ran for the first couple minutes but quickly switched to walking when I realized the pain that running created. 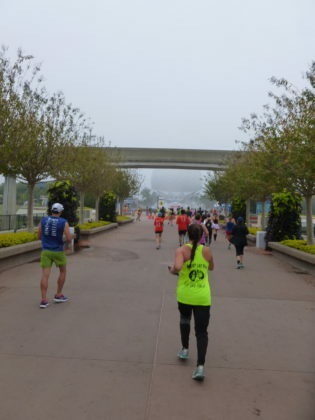 I was pleased to discover that I was capable of walking at a roughly 14-minute mile sustained pace, and after about four miles, my muscles had loosened up enough that running was no longer uncomfortable, which helped me finish the race strong. 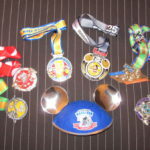 Although I usually finish in the top 10% of runDisney races, I’ve always said that I have a ton of respect for the slower runners, since they work just as hard as the quicker folks but for a much longer duration. 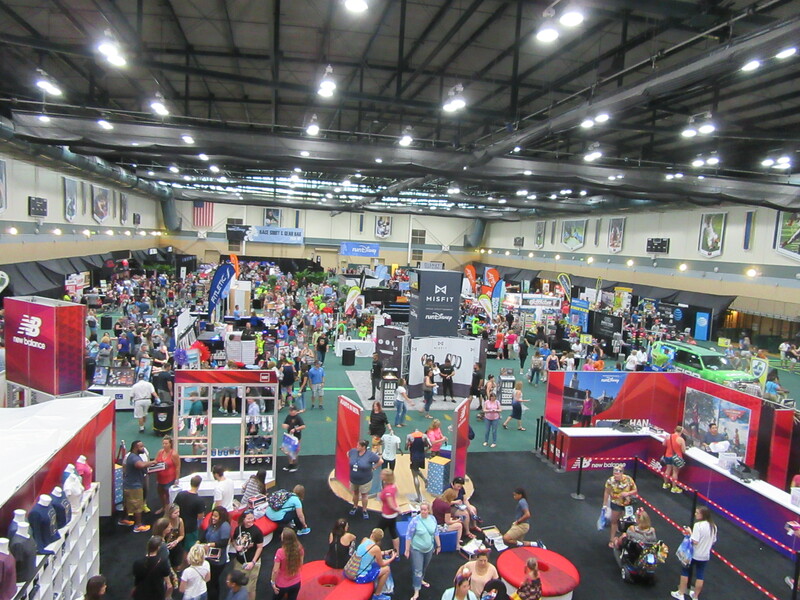 Having spent most of the race walking quickly and feeling how that impacts the body, I’m even more impressed by the large numbers of participants who exert that much energy at every race. One of the fun things about getting passed by a lot of runners was getting to see more of the various costumes people were wearing. Although I didn’t see as many costumes this weekend as I have at other events, there were a ton of really clever and more obscure ones that I especially appreciated, like Bernard and Bianca, Bacchus, and a pair of Tumble Monkeys. I dressed as Uncle Orville, the perennial unwanted houseguest from Carousel of Progress, and was thankful for the warm weather that allowed my half-naked ensemble. I don’t think most people understood my costume, but the ones who got it were really excited for it, making for an entertaining combination of puzzled and enthusiastic reactions. In all, 11,118 runners finished the 10K, with Gregory Opp from Somerset, PA winning the men’s division in 36:07. Sarah Kondo from Brantford, Canada won the women’s division in 42:24. I finished in 1:22:33, which is my slowest 10K to date by about 20 minutes, but I was happy with the time considering my condition. 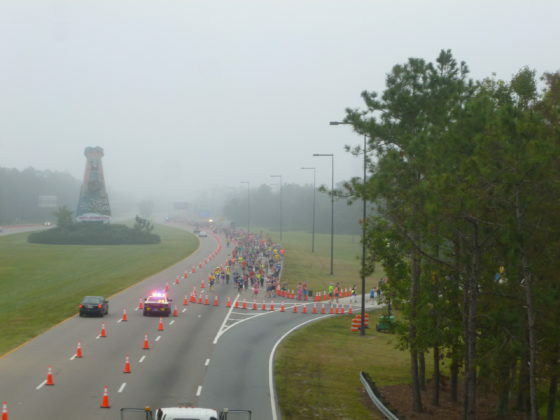 The 13.1-mile half marathon course began in the Magic Kingdom parking lot by rounding the former site of the Walt Disney World Speedway. 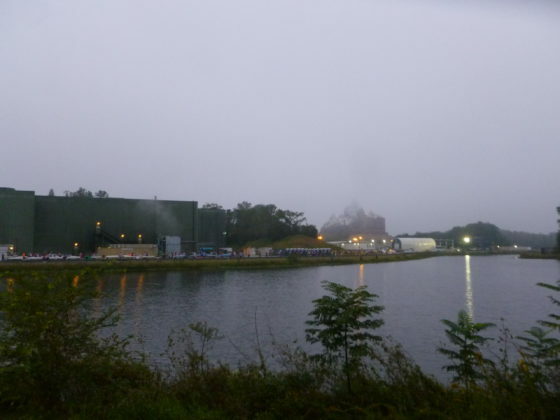 Runners then turned onto Bear Island Road, passing the water treatment facility and tree farm en route to the Animal Kingdom. Entering the park in Africa, the course followed the wooden boardwalk into Pandora, passing under the floating mountains. 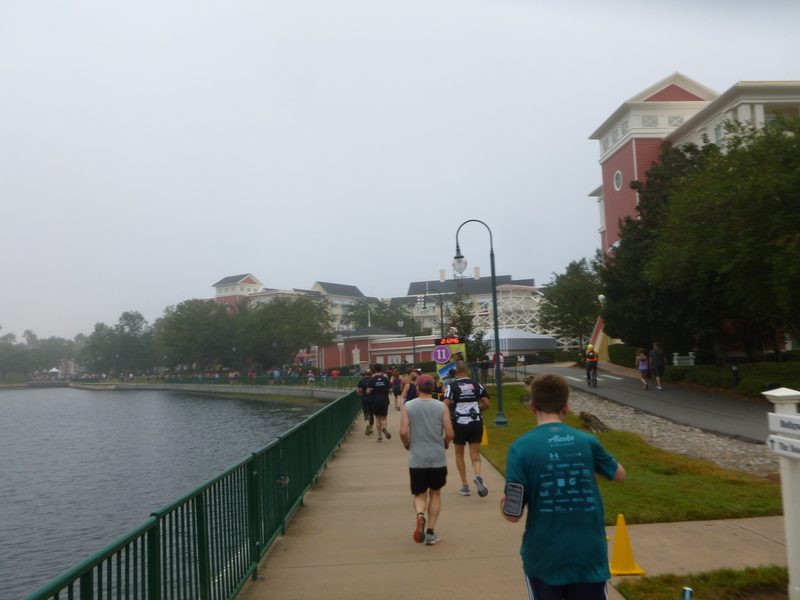 The course then crossed to Discovery Island and Dinoland, followed by a long lap around the parking lot before heading east on Osceola Parkway. After a hairpin turn onto World Drive in the opposite direction of traffic, runners ran up the exit ramp to Buena Vista Drive for a quick pass through the Studios and the Boardwalk area. Runners entered Epcot near the United Kingdom and traveled the long way around World Showcase en route to the finish line in the parking lot. Arriving at the start area around the same time as the previous morning, we encountered a massive increase in crowds. Where we waited a couple seconds for port-a-potties before the 10K, we waited nearly 30 minutes prior to the half marathon. Considering there were only about 20% more runners the second morning, I’m not sure what caused the huge difference in crowding. 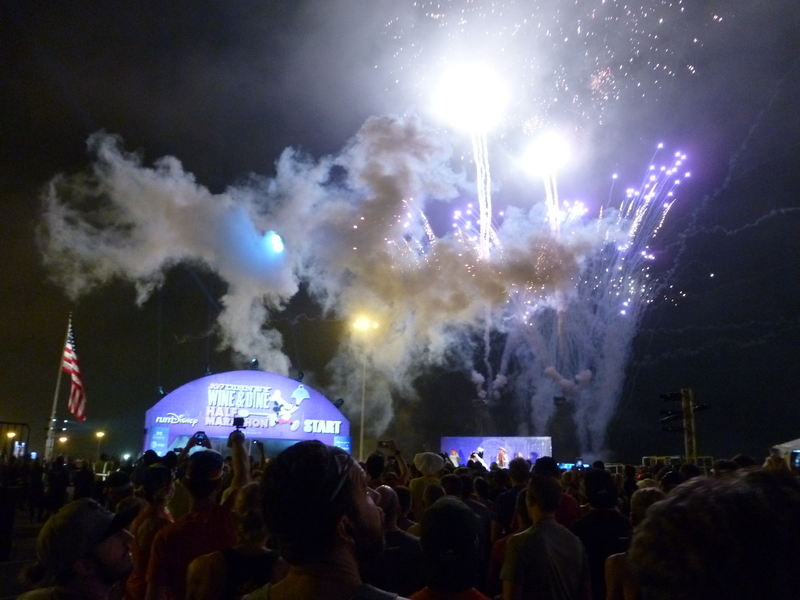 One of the great things about the start line location was the ability to have large-scale fireworks for each wave start. 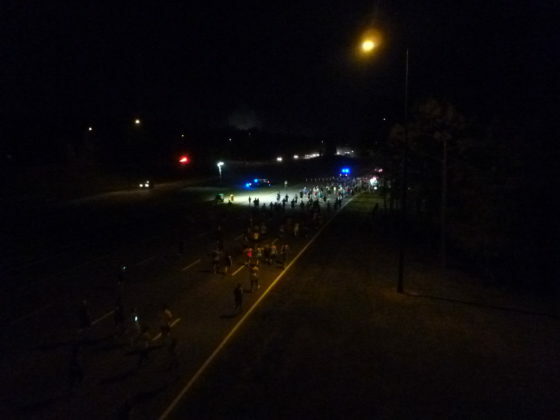 However, the course took runners downwind of the launch site about a mile into the race, leading to smoky conditions and pieces of shells falling on the road; I don’t think anybody was in real danger, but it was an unexpected hazard along the way. I walked most of the first few miles, slowly making my way along Bear Island Road as others passed by. I was delighted to come across a group of entertainers along this isolated part of the course from the now-extinct Adventurer’s Club, which brought unexpected energy to an otherwise solidary stretch of pavement. 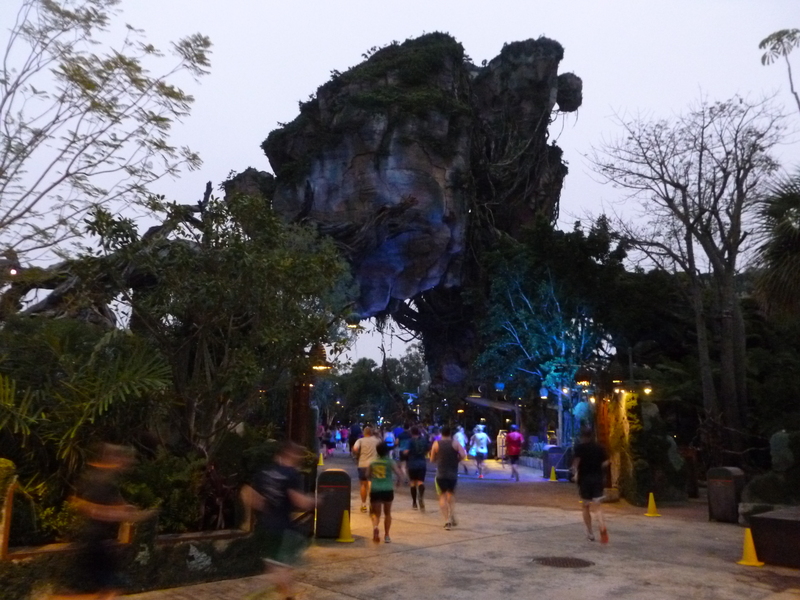 This was the runDisney event to pass through Pandora, which was a great addition, but created some potential issues for faster runners due to how dark the area is at night. Additional lighting rigs were placed along the course and the Daylight Saving Time change was to our advantage (allowing us an extra hour of sleep before our still-early alarms), but considering how dark that area is during park operations it seemed like it would be very difficult to run through even with additional lighting. Dawn had broken by the time I arrived, taking away the excitement of the bioluminescence, but I appreciated the extra lighting and safety. 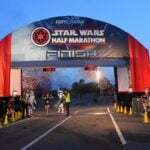 Although not the most exciting course I’ve ever run, I thought it was pretty solid overall. 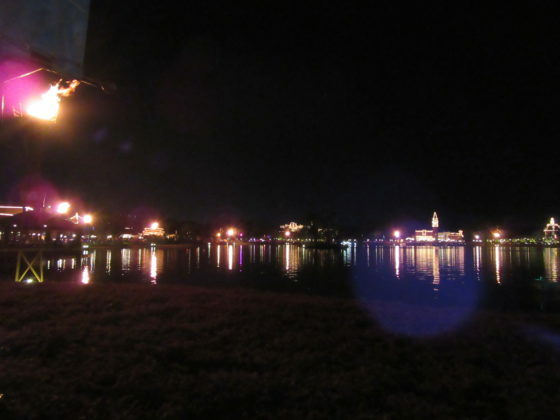 I especially enjoyed the final lap around World Showcase, which is similar to the end of the Marathon in January. That final segment is one of my favorite parts of any course I’ve ever run (Disney or otherwise), so it was great to get to do that again but without having to run an entire marathon leading up to it. Cast members holding flags were stationed at each country, enhancing the race’s international theme. In a rare feat, Giovanna Martins of Sao Paulo, Brazil, was the first finisher in 1:19:16. With 13,178 competitors, she is believed to be the first female overall winner of a half marathon with this large a field. Paul Graham of Whitehaven, UK won the men’s division in 1:19:22. I finished the race in 2:33:33, slowly warming up in the first half and running most of the second half. In the nighttime incarnation of the Wine & Dine Half Marathon, the real highlight was the afterparty, which immediately followed the race and went until 4 a.m. With the weekend’s new morning-based schedule, which was modified to allow nighttime spectaculars for day guests in the parks along the route, the party becomes relegated to Sunday night, long after the conclusion of that morning’s race. Although it gave everybody time to rest and shower, the separation took away a lot of the excitement at the party, and also removed the nervous energy from the race, when runners wanted to finish faster in order to get more time at the party. 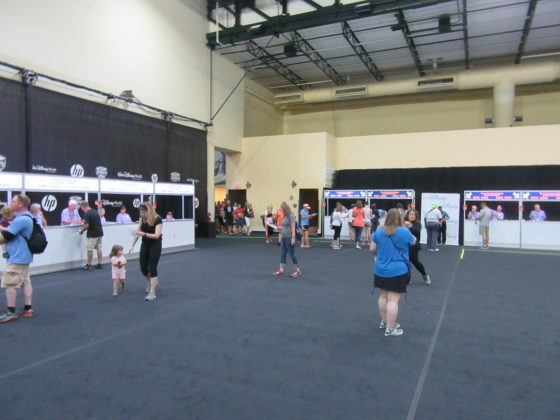 Featuring all 35 International Food & Wine Festival kiosks, the party didn’t really seem all that different from the normal operations of the park, except that everything asides from the kiosks and four rides (Frozen Ever After, Test Track, Soarin’, and Spaceship Earth) was closed. 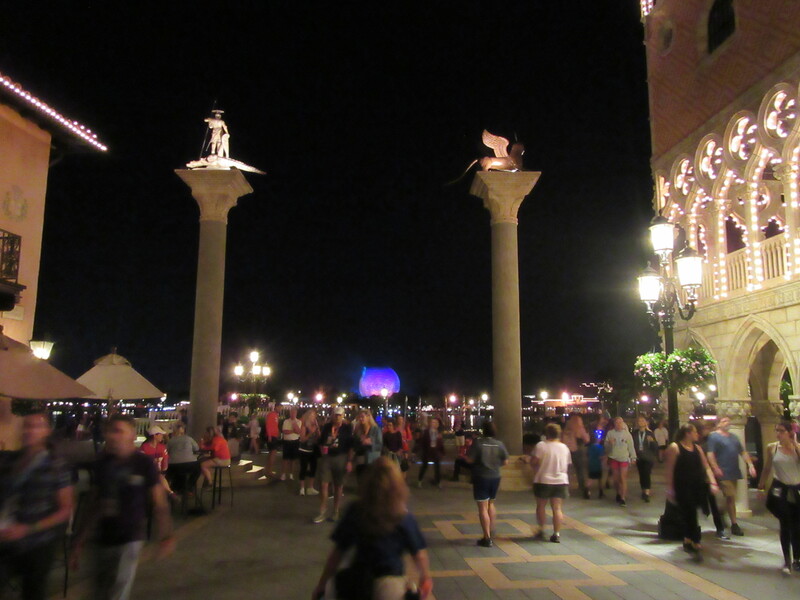 A DJ was set up at the Fountain of Nations and broadcast all over the park, leading to strange moments when his disembodied voice tried to interact with party goers that were a half-mile or more away from you. Although it was crowded at the beginning, the event cleared out within the first hour once people discovered that there really wasn’t much going on, beyond long waits for character photos. 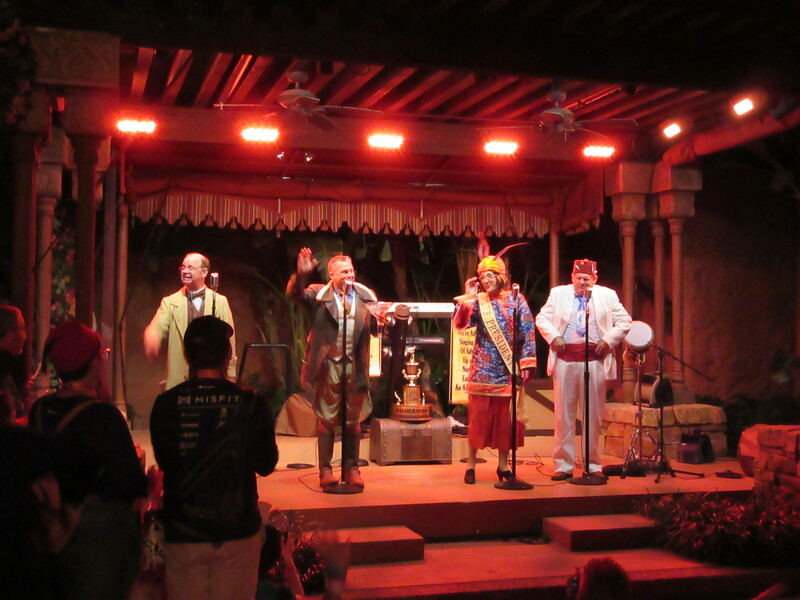 The real highlight for me was getting to see a reunion of the Adventurer’s Club. I was never able to visit the Club before it closed, so it was great to finally see what all the fuss was about. Although everybody had a great time, I can see why it was closed, as it doesn’t exactly fit with the current overly-family-friendly mindset of Disney World leadership. 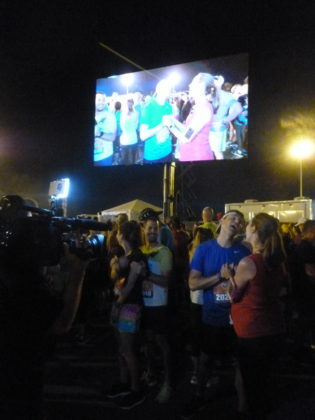 With a late-night crowd of rowdy runners, it was a lot of fun and a pleasantly unexpected addition to the lineup. 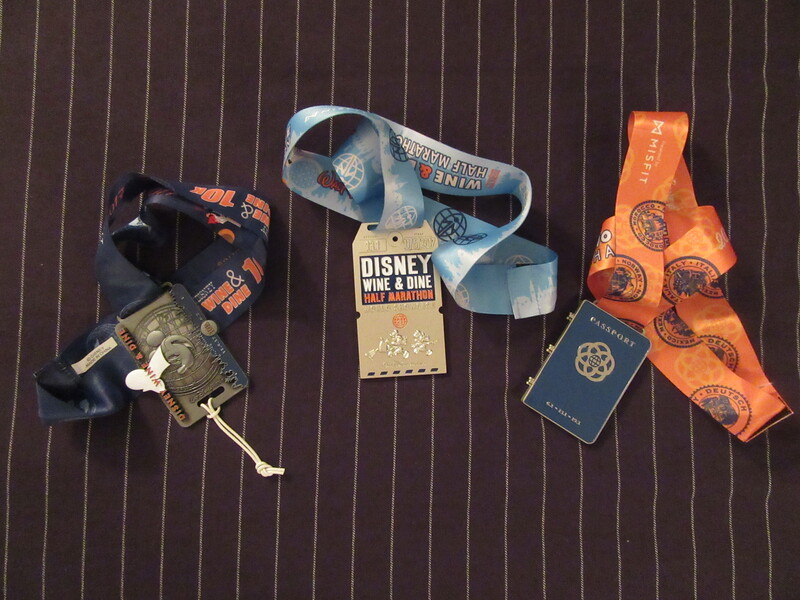 In all, it was an enjoyable race weekend, just like runDisney always does. 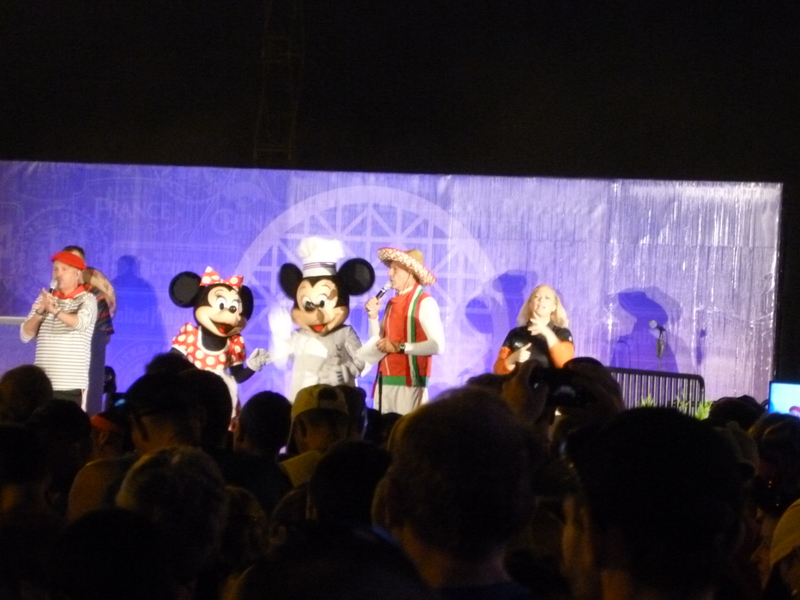 However, it didn’t feel like there was much to make the Wine & Dine events unique, and there was very little buzz and energy related to the Food & Wine theme of the event. 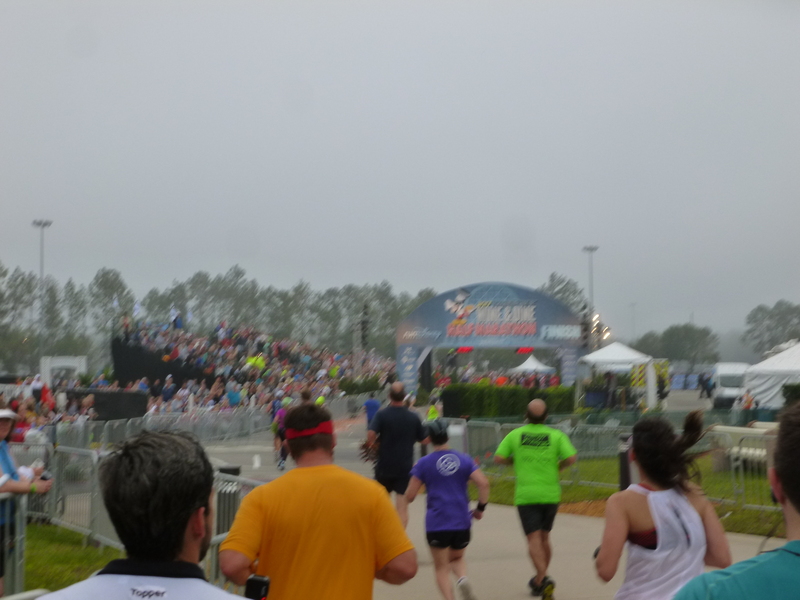 The first 2/3 of the 10K course is downright boring, and half marathon course is good but not great. The after party isn’t bad, but there’s not a lot to make it special, and it’s hardly worth changing your travel plans to accommodate it; you would be better off with just a normal day in the park. 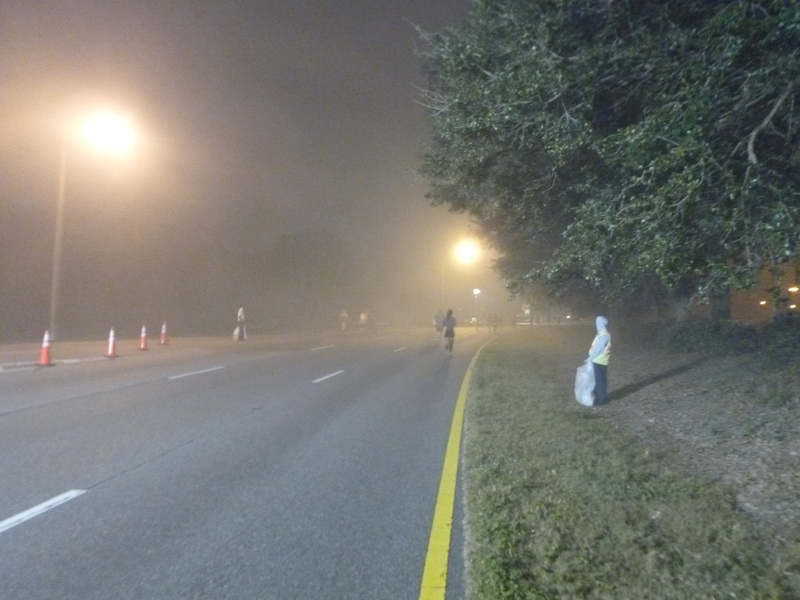 If you want to run at Disney World and this weekend fits your schedule, you will have a good time; for me, I will probably wait for this to return to a night race before I make this weekend a priority again.